I am thrilled, honored… even tickled to announce this guest post by a commenter you may know as Whistler. I’ve always been struck by the strength, hope, and humor in his words. For such a limited format, his comments felt powerful and left me wanting to hear more of his story. Alas, he has no blog of his own. Thanks to a gentle nudge from Christy (in where else but the comments…it’s like a fun after-party, minus all the drugs! ), Whistler sent the post below, which shares a glimpse of his experience, strength and hope. I hope it brightens your day too and please join me in congratulating Whistler on his one year sober. Went to see the doctor the other day for my yearly physical. Please understand, this doc and I go way back. Also understand, up until a year ago I had been drinking for 30 something years. If I wasn’t a blue ribbon drunk, I’m certain I was at least a prize winning drunk. And just so you know, alcohol doesn’t immediately evaporate when we drink it, which means my doc is accustomed to seeing my weight, blood pressure, cholesterol, and all those other body parts and functions at unhealthy highs and/or levels. By the way, you know he never once asked me about my drinking? Not once. Of course I never brought it up either. Would you, ignorance being bliss? He’s a good experienced doctor so I know he must have known. Of course when I think about it, I suppose most everyone must have at least suspected. It’s hard to camouflage a drunk, but drinkers tend to walk around like we’re wearing the cloak of invisibility. I went the recluse route, but even little kids and dogs know something’s off kilter when they see it. Denial is strong stuff and a drunk in denial is particularity obstinate. Anyhow, I have to do a yearly physical with this doc or he won’t continue to order my prescriptions (blood pressure and cholesterol, go figure). Plus every few years (next month) I have to have a flight physical from a different but specially qualified doctor. Yes, I used the word flight but please relax, I am not a commercial pilot and I never drank when flying or flew drunk but… how do you separate daily drinking from daily living? I mean, can one completely separate the influence and consequence of alcohol from that which is a practicing and over-indulging daily drinker? There’s more to drinking than just being drunk and then hung over. Some of you fellow former drinkers know what I mean. The foggy overall mindset of a drinker combined with the mental race to the next beer can oblige some mighty stupid tricks. But back to passing flight physicals. It is not that tough if you schedule it on an early Monday morning with your last beer the previous Saturday night, drinking gallons of water, and concentrating like crazy. And it takes great concentration. Like the time I got pulled over by the Highway Patrol and they gave me the eye test finger following thing because I smelled like a brewery. But of course the best way for a consistently heavy drinker to pass a flight physical is to know the Flight Physical Doctor (this doc died last year so don’t go looking for him) for dozens of years and he’s a buddy of your retired commercial pilot step dad who doesn’t drink at all. Remember when it comes to objectives like that, it’s not what you know, it’s definitely who. So, my doc was happily surprised this year when he saw my lighter weight, my exceptionally normal blood pressure, and my green with envy cholesterol levels. I suspect he thinks these results were an outcome of his good doctoring and suggestions but in truth, it was the simple product of sobriety. No joke, without booze I feel better, look better, think better, live better. Now I almost look like I know what I’m doing some days. My doc probably thinks better late than never. Oh, and that horizontal gaze nystagmus sobriety test conducted on the roadside by the Highway Patrol? He had me dead to rights but he let me slide. Gave me a warning for failed license plate lights. That was the last time I drove drunk. It was one of the last times I drank. It was one of the reasons I stopped drinking. I framed the warning; it’s on my workshop desk. He will probably never know what a true good he did for me. God, please bless Officer Brooks. This is my new friend, Josie. Well, I’ve followed her blog for more than a year, so she’s hardly a new friend. It’s just that we only recently realized we lived about an hour apart, which feels like the same town in Blogland. One of my favorite blogs is by a woman in New Zealand, for chrissakes. Meeting Josie and her lovely family (more on that in a bit) was due in large part to Christy over at Running on Sober. I’ve never met Christy in person, but one day I hope to. She encouraged Josie to do her first ever 5K, and Josie mentioned one close to me in support of National Recovery Month, and then other blog friends wrote words of encouragement and really I’d need a whiteboard to map out my point, which is that it all felt very interconnected and cool to be a part of. 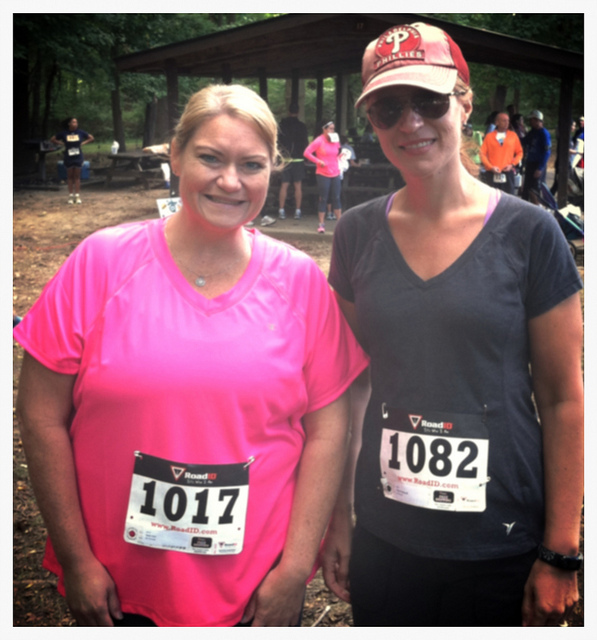 Race day came and I was less nervous about doing a race and meeting a new friend than I’ve ever been. I don’t know if I’ve properly conveyed how stressed out I’ve been lately over work and family schedules, and honestly I hope I haven’t. They aren’t end-of-the-world type issues, but I was feeling them hard and I let that anxiety trickle down into all areas of my life. In hindsight, I needed something positive to focus on, which is where the 5K and meeting Josie came in. Usually when I meet someone for the first time, they’re not at all like I’m expecting. They don’t look or talk or act like how I’ve imagined them. I think this speaks to the openness and honesty of Josie’s blog, but she is just as down to earth and friendly and lovely in person as she is in her writing. I felt an instant connection meeting her in person. This is why I blog – to stay connected with others in recovery. I’ve realized in recent months how easy it is to get busy or burnt out and how that leads to a natural complacency in recovery. I do believe these cycles are an inevitable part of recovery and pose no real threat if we address them. I can’t always be moving forward and stress will hit and hurt and there is little I can do in those moments but hold on. But I need to keep an eye out for the good things to grab ahold of too. The 5K itself felt low key and low pressure. There were somewhere around 100 participants and it was held in a beautiful state park less than a half hour from my house. Josie and I lined up at the back since we were walking this one, and then we pretty much gabbed for the next 50 minutes. Talking to someone and dodging countless earthworms on the path makes a near-hour fly by, let me tell you. In addition to meeting Josie and walking in lovely, fall-like weather, I also had the pleasure of meeting her family. The two words that come to mind are charming and adoring. The mutual love and respect was a privilege to witness. I know my family was the number one reason I stopped drinking. Okay, maybe the hangovers were too painful to ignore, but I couldn’t take the thought of hurting my kids or husband with something I wasn’t enjoying much anymore anyway. Since I stopped drinking, those relationships have blossomed in ways that are hard to describe. Sometimes they feel too raw and my flaws too exposed. Other times I’m struck by the simple beauty of the moment – the smell of my little one’s head after a bath, how hilarious my husband can be, how clever and sweet our 12 year old is, especially with her sister – and then I feel how deep these connections are in a way I don’t remember before. Sober friendships feel equally important and come more easily than any other kind. When I first got sober and heard other women talk about their sober girlfriends, I thought not me. I stopped making new friends easily somewhere around young adulthood and felt mostly okay with that.Then, around 6 months sober I made my first sober friend at a meeting and then added a few more here and there and looked up one day to see a network in place. Some people live within minutes of my house, others live impossibly far away but are no less important. Sober talk in general feels stripped of the pretense and guardedness I normally feel when I meet someone new. Sober folks are also some of the friendliest I’ve met, so don’t be afraid to reach out and comment on a blog you like or talk to someone you relate to after a meeting. That’s how I got started and where it’s taken me feels pretty incredible. Most of us remember where we were 12 years ago today. 9-11 became our generation’s JFK or MLK assassination, a day we can unfortunately recall the mundane details more vividly. I remember driving my husband to the PATH train in the small town in north Jersey where we’d moved only the year before. My husband was doing freelance work in NYC and I was a stay-at-home mom with our then baby girl. When I think of 9-11, the first image that comes to mind is our baby girl in her blue flowered carrier, her brown eyes wide and her lips pursed in that serious, almost studious look that all babies seem to master unless they’re crying. I remember getting a panicked call from a friend right after baby girl and I got back from the train station. “Is Joe ok?” he asked. This friend was prone to drama and I had no idea about the plane or the tower (it was just one of each at that point) but I turned the news on and any ease I’d felt drained away. I finally reached my husband on his cell and found he’d been on the last train that pulled into the World Trade Center stop. He said the train sat and sat but the doors didn’t open and passengers went from curious to restless to angry. He said he smelled a pungent odor, which in retrospect might have been jet fuel, but of course no one had any idea what was happening above ground. Eventually an official announced that the train would be redirected to Newark due to “police activity” and everyone groaned. They didn’t know yet how lucky they were. I remember driving along a highway with a parallel view of the new york city skyline and seeing smoke spill off of both towers. I remember watching a sea of people in smart looking suits and dresses pour out of the Newark train station and not feeling terribly worried how I would find my husband because he’s really tall. I remember asking him to drive home once we found each other because traffic was snarled everywhere. Once we were safely home, we walked to the top of our hill and saw massive smoke and dust clouds in the city skyline. By that point, both towers had collapsed. A coworker of my husband’s found himself stranded nearby and came to our house to huddle around the television and only left when I asked if I could please drive him home. In those days, I was a nightly drinker, but I remember being alert and clear for the drive. In those days, I still used alcohol recreationally and never thought to down a shot to numb or quiet jangled nerves. When I think back 12 years ago, I feel a sweet sort of tenderness for my old self. I was a new mom and had no idea how certain hardships would change our family and mold it into something almost unrecognizable. Really, I’m not talking tragedies but standard life-altering events which feel anything but standard when we’re in the thick of them. Afterwards we pick them up by the edges and examine and say “yes, I handled that one pretty okay, I did” or maybe we furrow our brow and set it back down to look at another time. I get now why we say we must learn history so we don’t repeat it. Lately I’ve felt a certain complacency in sobriety that ripples through my subconscious and makes for weird drinking dreams and a certain craziness in my waking state. I haven’t entertained serious thoughts of drinking again because I know the effects would be disastrous, if not immediate. This is what is saving me right now, this absolute certainty that I can’t drink socially or casually or moderately. Not now, not in 20 years, not ever. Many things have changed over the last couple of years, but this solid truth I feel deep in the core is not one of them and I hope to god I never forget. Heading into Year 3 Sober produced one of the best and yet craziest summers I can remember. 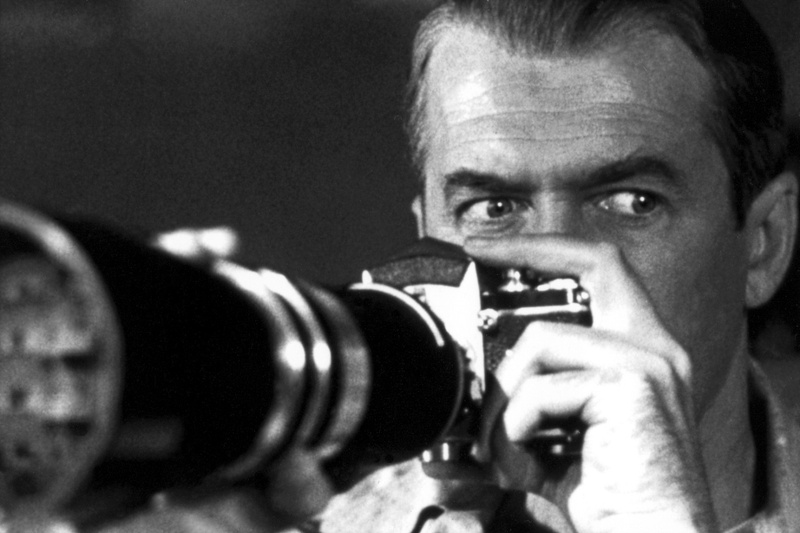 And by crazy, I don’t mean swinging-from-the-chandeliers, whooping-it-up fun, but more the anxiety-riddled claustrophobia played so well by Jimmy Stewart in Rear Window. I say it was one of the best summers I can remember because I truly felt alive and blessed. My family enjoyed two week-long vacations at the beach and weekends at the pool, plus trips into the city for museums or into town for ice cream. We cooked out and camped out and caught lightning bugs and did all the things that scream summer. If summer were a meal, I ate the whole thing and feel satisfied. And still I suffered and continue to suffer my share of Rear Window crazy. But while Jimmy Stewart’s character was immobilized by an itchy full-leg cast during a heat wave, I rambled out for longish runs in the quiet cool of early morning in an effort to stay sane. And while Jimmy witnesses what he’s pretty sure is cold-blooded murder in an apartment across the way, all my battles happened in my own head. In retrospect, Year 1 Sober was about learning to live life without alcohol. Year 2 Sober was about figuring out who I was without alcohol. Year 3 Sober seems to be – so far – about how to learn to live with myself without wanting to drink or otherwise give up. And because I find myself blowing small things out of proportion and manufacturing drama out of everyday stressors, I think of the 11 signs of relapse. And I worry about where I’m headed and wonder what I can do to reverse the process if I am heading down the wrong road. A paper on Relapse and Recovery published by the Caron Foundation says how we cope with stress matters. The influence of stress as a relapse trigger appears to be lessened by the individual’s method of coping with it …It appears that problem-solving coping styles are more beneficial than emotionally focused coping styles. Oh boy, do these sound familiar. Especially the last three! Taking Control – this response involves changing the relationship between yourself and the source of stress. Examples: escaping from the stress or removing the stress. Information Seeking – the most rational action. This involves the individual trying to understand the situation (e.g. using the internet) and putting into place cognitive strategies to avoid it in future. Information seeking is a cognitive response to stress. Evaluating the pros and cons of different options for dealing with the stressor. Hm, the “taking control” one fills me with a kind of terror, though I can gather information and evaluate the pros and cons like a pro. It is important to note some stressful situations are beyond our control, such as illness or the death of a loved one or actions of others. In these cases, emotion based coping skills are our best hope at relief. But problems we do hold some control over benefit more from problem focused coping skills because these might actually help eliminate them. Right now I’m applying both kinds of coping skills for a few stressful issues. I’ve even used emotion based strategies when my problem solving strategies fail. And these are not even serious issues, which again makes me wonder why I seem to be falling apart at times lately. I think I’m feeling the cumulative effect of a dozen tiny stressors, mixed with one or two bigger ones. Some of the things I do to cope normally, like eating well and sleeping enough and reaching out to others, have fallen away and I’ve forced myself to get back on track, but not as often as I was doing before. All I had to do was look through my blog posts from this time last year to notice a pattern. Apparently I struggle more this time of year. Don’t really know why and maybe it’s beyond my control, but it does help to be aware of it. In writing all of this, I’m tempted to delete and start over with something more polished and positive. I don’t want the newly sober to think it doesn’t get easier over time (it DOES). I don’t want others to see me as weak and whiny or not where I should be at this point in my sobriety. Still, time has given me another voice that tells me perfection is not only overrated but impossible. The only way out is through the messy stuff and this sure feels like one messy post! If you care to comment, I’d love to know if you feel triggered by stress at random or predictable times of the year and how you cope with it.